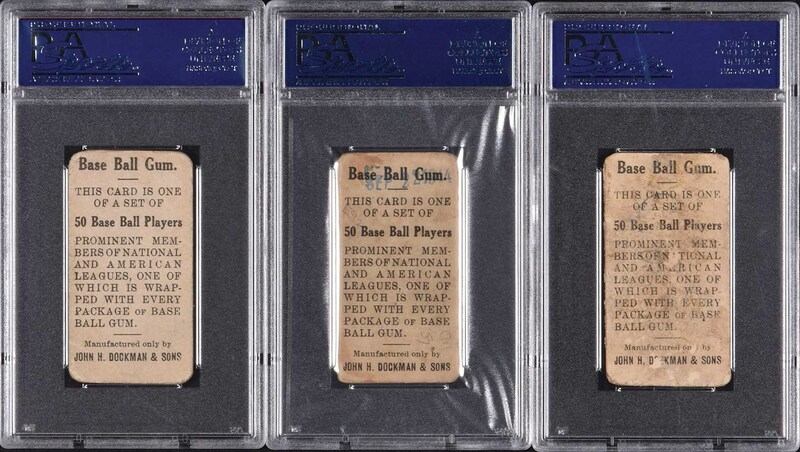 Collection of six cards from the E92 Dockman & Sons caramel-card set, each graded and encapsulated by PSA and highlighted by Hall of Famer Nap Lajoie. 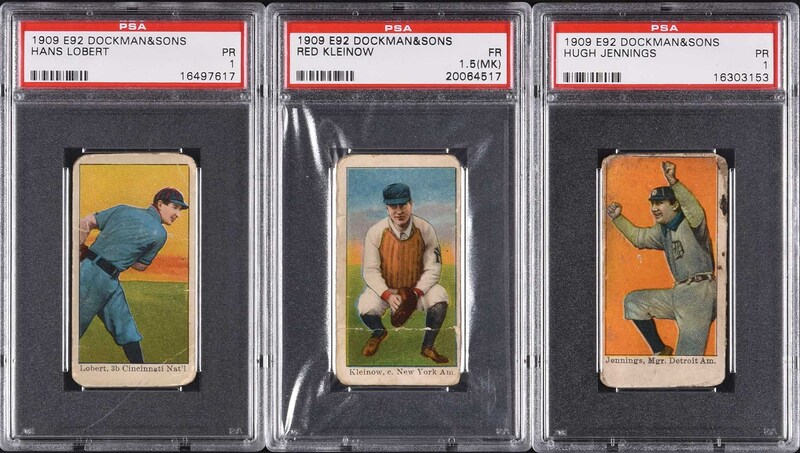 E92 Dockman & Sons is a very scarce caramel issue from 1909 that shares designs with several other closely related candy issues (Croft's Candy, Nadja Caramels, etc.) from the same era. This collection consists of the following: Art Devlin (GOOD 2, New York Giants), Wild Bill Donovan (GOOD+ 2.5, Detroit Tigerss), Hughie Jennings (HOF, PR 1, Detroit Tigers), Red Kleinow (FR 1.5 [MK], New York Highlanders), Nap Lajoie (HOF, GOOD 2, Cleveland Naps), and Hans Lobert (PR 1, Cincinnati Reds). Despite their modest grades, the offered examples are all bright and crisp, with brilliant colors and flawless registration. 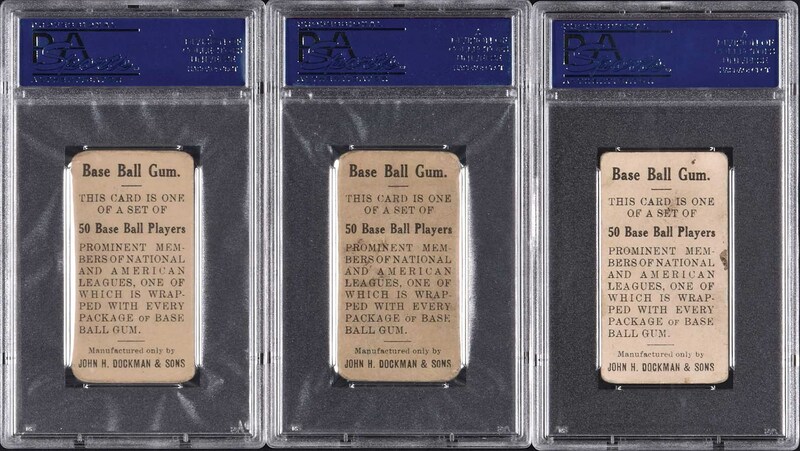 Caramel cards, because they were issued with candy, one card per package, did not easily escape damage or hold up well to wear over the years. 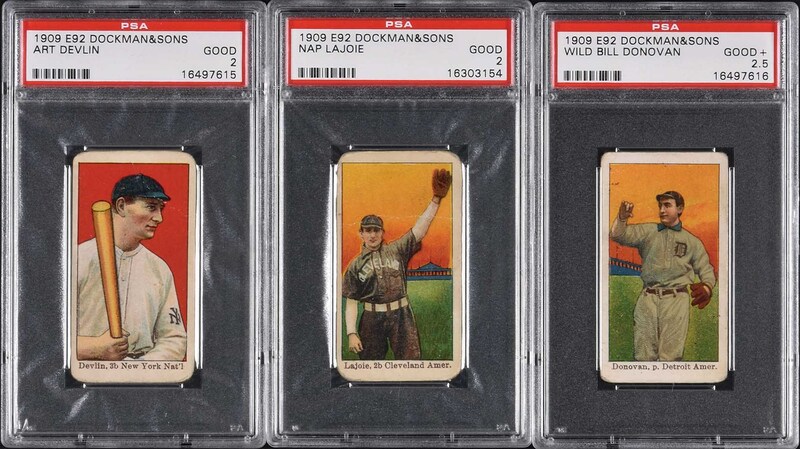 This collection represents a relatively affordable start to collecting one of the most popular, elusive, and colorful of all “E” card issues. Total: 6 cards. Reserve $200. Estimate (open).